Fifa World Cup mania is here and Adidas is celebrating with the launch of a commemorative ball that’s covered with stunning Swarovski crystals. This ball is definitely not meant to be tossed about on a muddy field, instead it incorporates traditional Russian embroidery in a creative new way that begs to be displayed. Made from black velvet, this piece of merchandise is pretty different to the footballs you’re used to seeing. It’s gets an extra dose of opulence from the gold Russian embroidery that pays tribute to the host nation. The embroidery also incorporates sparking Swarovski crystals, just in case you didn’t think this football was lavish enough before. 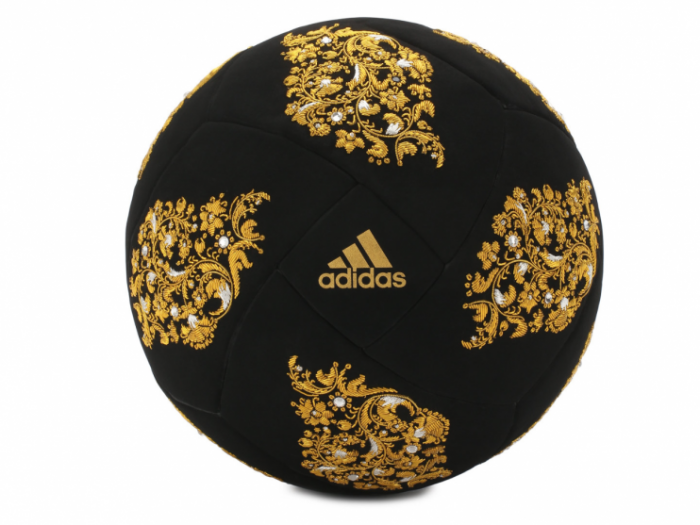 Even though Adidas items are popular all over the globe, this ball is only available in Moscow, so determined collectors will have to make a trip to get their hands on it.